Anki's charming Vector robot is getting a big boost, with Amazon Alexa integration allowing it to take control of your smart home. Users in the US can already give their Vector voice commands to turn on their lights, adjust their thermostat, and now the bot is receiving the same upgrade in the UK. "A lot of our Vector owner community – especially people who pre-ordered – really requested this feature," Meghan McDowell, director of program management at Anki, tells TechRadar. "We find that people really love the home integration, giving Vector control of your smart home devices, like turning on lights, thermostats, he can do shopping lists, notifications, things like that – it really adds to the helpfulness that Vector can provide. McDowell is based in the US, so she was able to use her Vector to control her Christmas tree lights over the holidays. "I loved that," she says. "Every night when I’d come home from work I’d say ‘Turn on the lights’, and I let Vector loose in my living room. "That was great, and I know a lot of people are using it for controlling their thermostat, turning the heat up and down, things like that, controlling speakers. It really does help to supercharge the usefulness that Vector can provide." 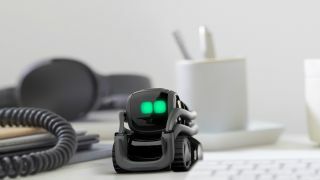 Anki goes to great lengths to give its robots personality (the company's character lead Dei Gaztelumendi has a background in animation and is a former character designer at Paramount Pictures), which makes interacting with them totally different to speaking to a cylindrical speaker on a table. "I think that people really relate to Vector," says McDowell. "He’s mobile, he’s alive, and people really care about him. You hear people talk about Vector as a ‘he’, and they refer to him as a being in their house." Anki has found that people tend to use Vector in much the same way as an Alexa-enabled smart speaker (mostly for controlling smart devices), but the robot's personality means the interaction feels more natural. "I feel like the future of home robotics needs to include character," McDowell says. "We've seen with Vector, and even some of our previous products like Cozmo, that adding character to AI and robotics really is where the magic happens. It’s really important to the future of people accepting robots in their homes, to have people feel comfortable, and have a better, richer, deeper experience with their robot." The integration doesn't change how Vector works – it's still designed to be part of your family, and you can still use all of its regular voice commands (including 'Do a trick', 'Come here' and 'Take a picture'). Once you've set up Alexa following Anki's instructions, you will be able say 'Alexa', then give a voice command, just as you would with any other Alexa-enabled device. There are a few limitations: Vector doesn't support communicating with people using features like drop-in, voice calling and messaging; it doesn't play songs and podcasts from streaming services; and it doesn't read books aloud through Kindle or Audible. For just about everything else – including hearing the weather, checking the news, and turning off the lights – just ask and Vector will handle the rest. "We’re really excited about this integration," says McDowell. "People have been asking for this. We hope that people really do feel that Vector’s now super-charged with helpfulness."